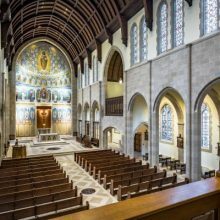 In the hands of talented artists, a worship space can be gifted with a harmonious liturgical artistry that truly inspires a congregation and community. 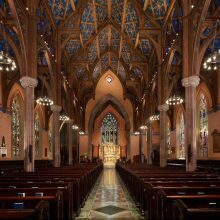 EverGreene recognizes the impact art and architecture have on people (in the pews and in the neighborhood.) Accomplishing this is a true art, whether in a new space or an existing one. Our Sacred Space Studio focuses exclusively on projects for religious clients. 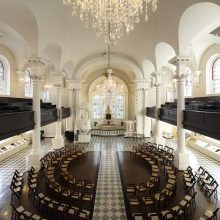 We work collaboratively with project teams to create architecturally appropriate designs informed by historic precedent. 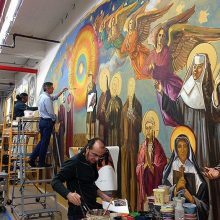 EverGreene has completed work with over 300 religious institutions on projects ranging from straight-forward painting, complex preservation strategies, simple statue restorations, and long-term planning for phased implementation programs, in modest parish churches, synagogues, shrines, chapels and ornate cathedrals from coast to coast.